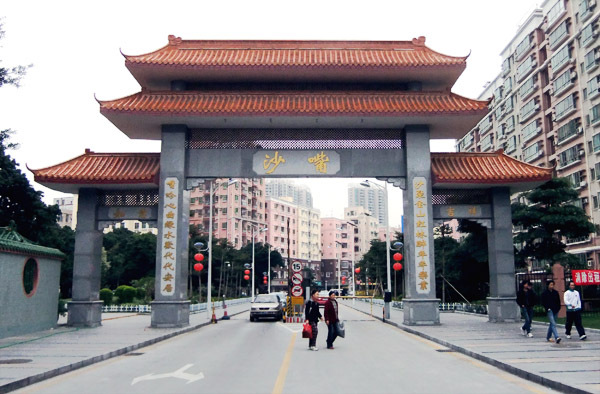 Shenzhen villages are places of unexpected encounters with tradition, living and reworked. Indeed, these encounters are reason enough to meander through the villages. Just to the left of the entry gate to Shazui, for example, is a temple to Hongsheng (沙嘴洪圣宫), which is kept by an older Shazui couple. I asked about Hongsheng and they invited me to sit and chat. Historically, Shazui villagers made their living fishing in the northern section of the South China Sea, beyond the mouth of the Pearl River Delta. Hongsheng, as his name “Flood Victory” suggests is a god who protects fishermen of the South Seas. Hongsheng is also sometimes thought to be 祝融 (Zhurong the god of fire) and THE god of the South Seas, suggesting that Hongsheng is either a local manifestation of a more general god, or was a specific god that was absorbed into a larger tradition. From a decidely brief net surf, I have gathered that Hongsheng is very local. Most of the temples I came across were located in Hong Kong and this temple is the only one that I (thus far) know about in Shenzhen. Indeed, the Ou Family Association from Hong Kong (沙嘴[香港]欧氏宗亲会) had provided the computor printout with information about Hongsheng, which again suggests how local this god is. I’m wondering if this is because Hongsheng protects ocean fishermen? That said, throughout Nantou, most temples are dedicated to Tianhou (天后) with the largest temple at Chiwan. This entry was posted in noted and tagged blogsherpa, futian district, history, hong kong, houhai, prd culture, rural urbanization, shazui, shenzhen identity, urban village, 沙嘴洪圣宫. Bookmark the permalink.